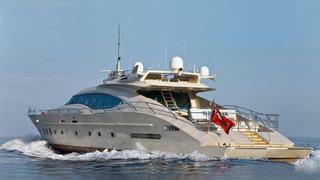 Kevin Bonnie at International Yacht Collection sends news that he's listed the 36.6m flybridge motor yacht Natalia for sale. Built by Palmer Johnson in 2005 to Lloyd’s class and MCA compliant, she's a product of the prolific Nuvolari Lenard design team. An interior featuring oak flooring and panelling accommodates eight guests in three doubles and a twin cabin, while twin 2,750 MTU engines give her a range of 900 nautical miles. A large saloon with excellent headroom has panoramic windows and relaxation and dining areas. Natalia also boasts an excellent charter record. Lying in Nice, France, Natalia is asking €5.9 million.